No one will suspect that this realistic bust is a bank, or that you're Batman! Okay, so you haven't installed those Bat-Poles yet, but if you keep dropping your spare change into this plastic vinyl bank, you'll save up for them in no time! 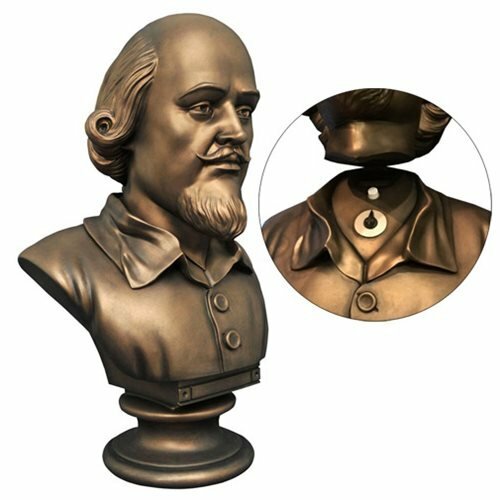 Based on the Shakespeare bust that unlocked the moving bookcase in the classic TV series, this life-size Batman Classic 1966 TV Series Shakespeare Head Bust Bank has a coin slot that is located in the neck, an access door, and a neck hinge so you can tilt back the head to reveal a dial and button! No one will ever suspect that this realistically painted bust is secretly a bank, or that you're secretly Batman. Measures 20-inches tall x 13-inches wide x 10-inches long.